• No attachment pin to remove. • More time for recreation, less time in preparation. Constructed from premium grade steel with nickel-chrome plating for long life. Switch~Ball™ is guaranteed for life against defects in manufacturing. 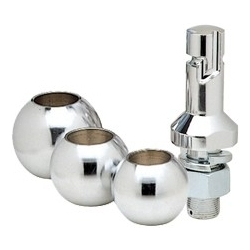 Switch~Ball™complies with National Standard SAE-J684 and V-5 Regulations for conversion ball sets. The exclusive ‘J’ Groove design ensures with the ball installed on the shank and engaged by a coupler, the hitching system is secure and has been proven safe through independent testing. Designed so the weight bearing capacity is resting on th shank taking the stress away from the ball freeing the coupler from friction and binding, providing smoother and safer towing. US Patent #5,169,168 Canadian Patent #1,325,445.